Timothy Rasinski is co-author of The Megabook of Fluency, a winner of the Learning® Magazine 2019 Teachers’ Choice Award for the Classroom. In my previous blog post I stated that reading fluency is made up of two constituent competencies of processes—automatic or effortless word recognition and expressive or prosodic reading. One of the problems with programs for teaching fluency is that they tend to focus on one or the other of these competencies. Automatic word recognition is often taught through repeated readings aimed at getting students to read quickly. Prosody or expressive reading is usually taught through oral reading activities. Both components of fluency can and should be taught simultaneously. The key to this approach to fluency instruction is having students perform texts that are meant to be performed and for which they prepare through rehearsal. 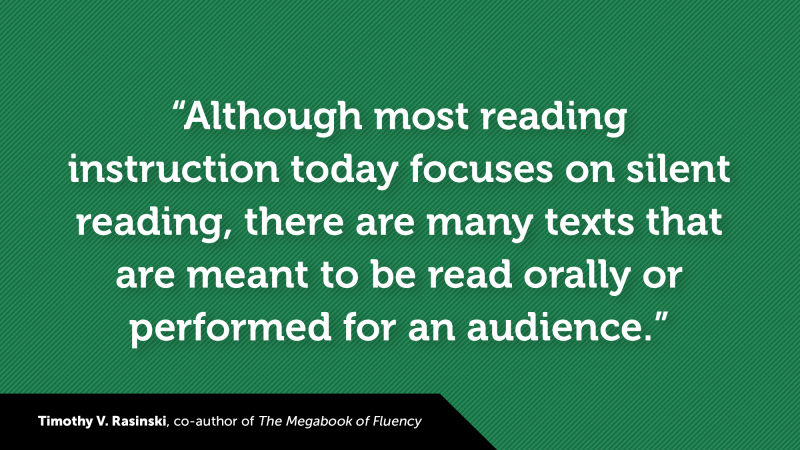 Although most reading instruction today focuses on silent reading, there are many texts that are meant to be read orally or performed for an audience. These include poems, songs, scripts (readers theater), speeches, monologues, dialogues, and such. These are texts that are not only meant to be read orally, they rely heavily on the expressiveness (prosody) of the reader to deliver meaning to an audience. Of course, in order to deliver an expressive or meaningful performance, the reader will need to rehearse the text he or she is planning on performing. Rehearsal is a form of repeated reading. However, unlike many approaches to repeated reading, the underlying goal of the repeated reading is not for the reader to read the passage quickly, but to read it with appropriate prosody that conveys meaning. When readers engage in rehearsal then, two critical reading competencies are being developed—automatic recognition of the words and phrases in the text through repeated readings of the text, and expressive/prosodic reading of a text that is meant to be performed orally for an audience. Imagine a primary or intermediate classroom or school where every Friday there is a “Grand Performance.” Students will perform for their classmates and others (e.g. parents, the principal, other classrooms, etc.) poems, songs, scripts, speeches, and/or other material that they have been rehearsing throughout the week. Let’s say a school wants to celebrate Shel Silverstein’s birthday (Sept. 25). On Monday, students can select poems by Shel that they would like to perform at the “Grand Performance” on Friday. Students can choose to read a poem individually, with a partner, or in small groups. Throughout the week, students should be given time to rehearse their chosen poems. Rehearsal can include teachers modeling poems for students, reading them chorally with students, listening to students perform and giving them feedback and encouragement. Always, the focus should be on delivering an oral reading of the poem that conveys meaning to the audience. This is also an opportunity to let families and community members know that you will be having a performance on Friday and that they are invited to see students perform. On Friday, near the end of the day, classrooms can be arranged in a coffee house style. Perhaps the lights could be dimmed and light refreshments offered to students and guests. Then, one after another, students, with chosen poems in hand, read and perform their poems for an audience of classmates and visitors. Remind audience members that the appropriate way to show appreciation for poetry is by clicking fingers at the end of each performance. Additionally, after each performance, invite the audience to provide positive comments. In the following weeks students will want to celebrate the work of other great children’s poets such as Jack Prelutsky, Nikki Giovanni, and others. Wouldn’t this be a great way to end each week! Students would leave school feeling like stars! They would also leave as better readers! Although the “Grand Performance” may be the icing on the cake, the real work was in the days of rehearsal that preceded the performance. By engaging in authentic, repeated readings, students are developing automaticity in their word recognition, prosody in their oral (and silent) reading, and comprehension as their rehearsal was aimed at conveying meaning to the audience. Moreover, these improvements go well beyond the passages that were performed. Rehearsal and performance of this type, when done on a regular basis, will generalize to improvements in new texts never before read by students (Rasinski, 2010). Moreover, students and whole school communities will find enjoyment and satisfaction in this authentic form of fluency instruction. In our new book, The Megabook of Fluency, Melissa Cheesman Smith and I offer readers a plethora of ideas for making fluency instruction authentic, meaningful, engaging, and effective. We are delighted to tell you also that our book was recently named a winner of the Learning® Magazine 2019 Teachers Choice Award for the Classroom.